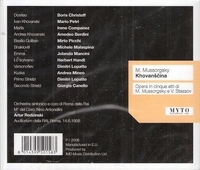 "KHOVANSCHINA is an opera in five acts by Modest Mussorgsky. The work was written between 1872 and 1880 in St. Petersburg, Russia. The composer wrote the libretto based on historical sources. The opera was unfinished and unperformed when the composer died in 1881. Like Mussorgsky's earlier BORIS GODUNOV, KHOVANSCHINA deals with an episode in Russian history, first brought to the composer's attention by his friend Vladimir Stasov. It concerns the rebellion of Prince Ivan Khovansky, the Old Believers, and the Streltsy against Peter the Great, who was attempting to institute Westernizing reforms to Russia. Peter succeeded, the rebellion was crushed and (in the opera, at least) Khovansky's followers committed mass suicide. Nikolai Rimsky-Korsakov completed, revised, and scored KHOVANSCHINA in 1881-82. Because of his extensive cuts and 'recomposition', Dmitri Shostakovich revised the opera in 1959 based on Mussorgsky's vocal score, and it is the Shostakovich version that is usually performed. In 1913 Igor Stravinsky and Maurice Ravel made their own arrangement at Sergei Diaghilev's request. When Feodor Chaliapin refused to sing the part of Dosifei in any other orchestration than Rimsky-Korsakov's, Diaghilev's company employed a mixture of orchestrations which did not prove successful. The Stravinsky-Ravel orchestration was forgotten, except for Stravinsky's finale, which is still used. Although the setting of the opera is the Moscow Uprising of 1682, its main themes are the struggle between progressive and reactionary political factions during the minority of Tsar Peter the Great and the passing of old Muscovy before Peter's westernizing reforms. It received its first performance in the Rimsky-Korsakov edition in 1886. Though not as well known as BORIS GODUNOV, this opera is, in some ways, more accessible. The pace of the action is slow, but there is more in the way of traditional vocal writing compared to the earlier opera's use of a more speech-like style. The plot of KHOVANSCHINA is difficult to follow, but the story is grittier and the characters are more believable. There are also some fiery set-pieces, in particular the 'Dance of the Persian Slaves' and the spectacular mass suicide of the Old Believers in the final scene. KHOVANSCHINA is not seen on stage often outside Russia." "Amedeo Berdini, possessor of a voice of real weight, coupled with a warm timbre, was a true lirico spinto, whose mentor, Gigli, opened the way to what seemed destined to be a great career. This tragically was cut short by his early death at the age of 44. Arias from Pietri's Maristella, Catalani's Loreley, Gomes' Salvator Rosa and Lo Schiavo, and a passionate Madama Butterfly love duet with Pina Malgarini will impress by their commitment and highly-compelling interpretations."